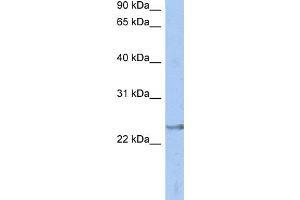 Characteristics This is a rabbit polyclonal antibody against ATP6V1E2. It was validated on Western Blot using a cell lysate as a positive control. Background ATP6V1E2 is a subunit of the peripheral V1 complex of vacuolar ATPase essential for assembly or catalytic function. V-ATPase is responsible for acidifying a variety of intracellular compartments in eukaryotic cells. This isoform is essential for energy coupling involved in acidification of acrosome.